If I’ve learned one lesson this past month, it’s to respect your digestive tube. The human body and what it’s able to accomplish is a wondrous thing. 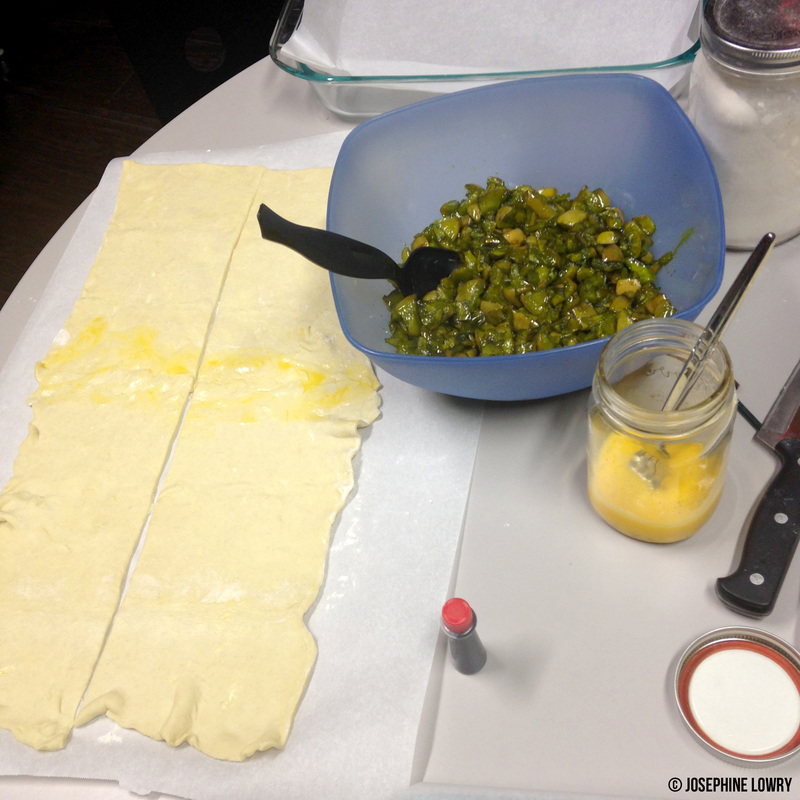 In fact, it’s something that should be celebrated — with intestinal strudel! While meat is my favorite medium, I sometimes like to mix things up and use fruit or vegetables in my art. Plus, a tube meat digestive tube is really a bit too over the top, don’t you think? 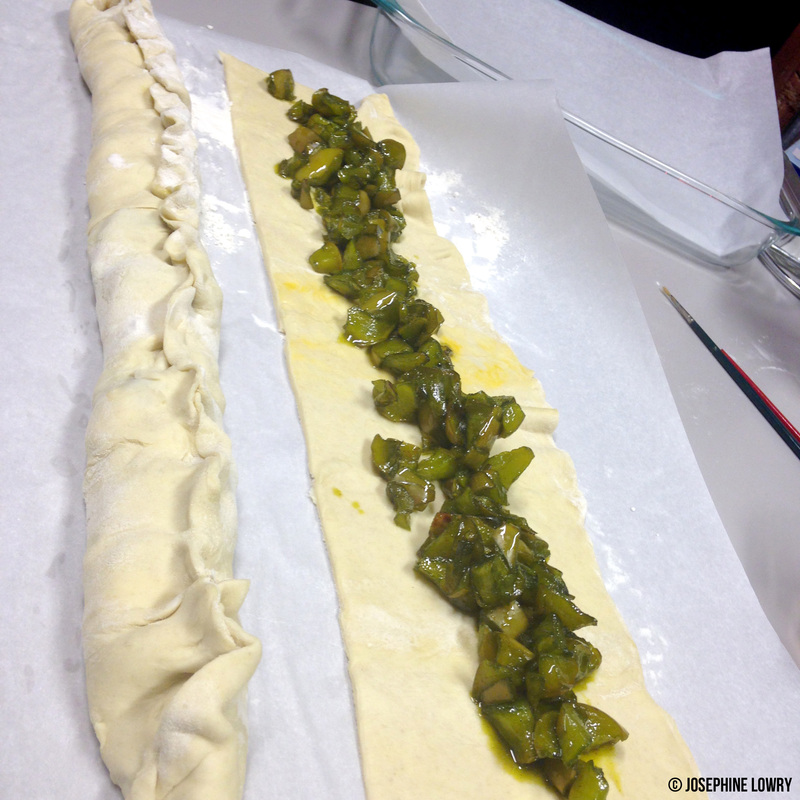 I based my creation on these puff pastry intestines, then josefiendafied it a notch. For the intestine insides, I sliced Granny Smith (Where’s Granny? In mah belly, that’s where!) apples and added lots of sugar and cinnamon. I also used an entire bottle of neon green food coloring. Go big or go home. Also, I was making a double batch of intestines. Then following the instructions in the puff pastry intestines recipe (see link above), I formed long strips of pastry, filled with the “tastes much better than it looks” cooked cinnamon apple mixture and doctored the sides together to form a nice seal. The green syrupy goodness from the cooked apples leaked out once cooked, so I recommend going full on med school to ensure your intestines are properly sealed so they don’t leak. Once I had the tubes formed, I placed them atop parchment bases in glass baking pans. How you shape the intestine is really up to you. I went with one fatter, less worldly version — something from a meat/potatoes sort of person who didn’t like to venture outside their food comfort zone very often. I also created a larger, er, gathering place at the end of the intestine. Life-like authenticity is important. Plus, I’m not quite sure what happened, but the length of each of the intestines varied by quite a lot. There’s something to be said about measure twice, cut once. 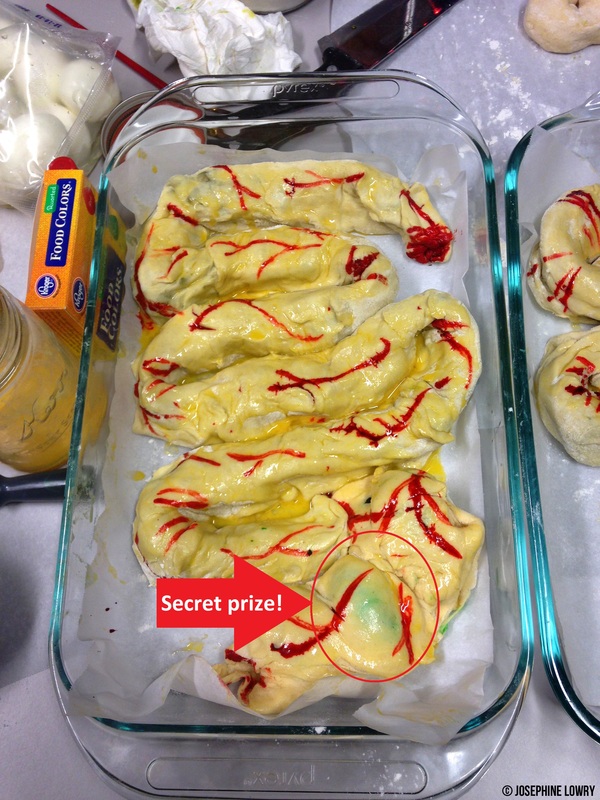 Hide a surprise in your intestine! For the second intestine, I created a longer, bolder one, then added a wee surprise* at the very end. Everyone loves surprises and intestines are no different! 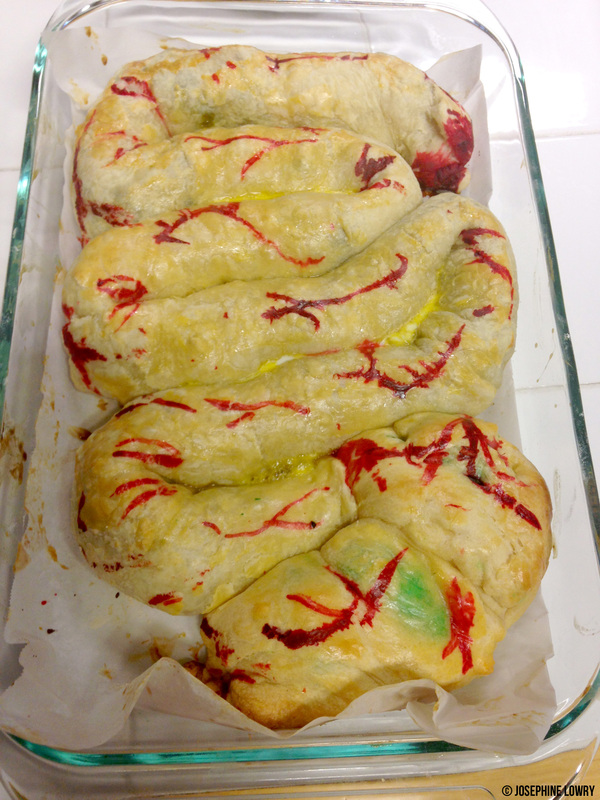 After basting the formed puff pastry with egg, I carefully painted red food coloring-based veins along the length of the intestines. I like to think it gives them a bit of added chutzpah! 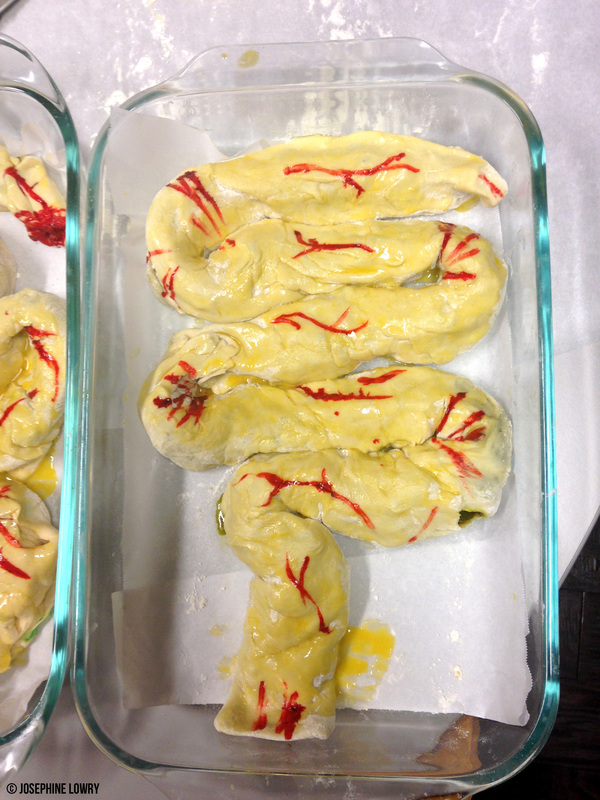 I also painted the ends of the intestines bright red. I’m not entirely sure what my rationale was at the time, but I think I was again trying for authenticity and wanted to mark the ends where they’d be divorced from the stomach. Also, I’m 99% sure that I cackled out loud numerous times as I was making these. I wish I’d taken pictures of sliced pieces. Color aside, the apples were the perfect mix of sweet and cinnamon. And the puff pastry provided a nice backdrop to the apples. * I dyed a peeled, hard-boiled egg green and placed it in the very bottom of the intestine. Why? Why not! Also farts sometimes smell like eggs. Remember: life-like art! OH. MA. GAAAAAAWD, I LOVE YOUR BRAIN! Heehilarious. Just wait until you see what I’ve got up my sleeve for Easter … !